If you’ve been following my Facebook page, you might know this first bit of news. I’ve started going out naked. Ok, no, not that kind of naked. But naked up top. On my head. I did it for the first time on Saturday. First to a street festival, then to see The Book of Mormon. I had initially told myself (during one of my many self-talks) that I wasn’t going to go out sans head cover for awhile still, until I really felt like I just looked like any other lady with short hair. But I’m an impatient person and I got tired of waiting. At first, all I noticed was how cold the wind felt when it hit my head. Hair really accounts for a lot of one’s body warmth. After awhile, I kind of forgot about it, although it’s hard to ignore the stares that I get. My sister says they stare because they think I’m pretty, but I’m not sure I’m really sold on that. I think most people stare because they are trying to figure out what my “deal” is. And to be fair, I’d probably stare a bit too. When I catch my reflection in a window or mirror, I can’t help but hear “Well, Sinead O’rebellion…” over and over in my head. If you have no idea what I’m talking about, you should probably watch more movies. Sometimes, I look at other people and try to imagine what they’d look like with no hair. Or I see people with hair like mine, and I tell myself I look better than them. I realize that’s really terrible and I probably shouldn’t be admitting that out loud. But I do what I gotta do to cope. And if convincing myself that everyone else would look ugly bald is the ticket, then I’m going with it. I’ve started taking photos to monitor my hair growth, because otherwise, I don’t believe it’s growing. 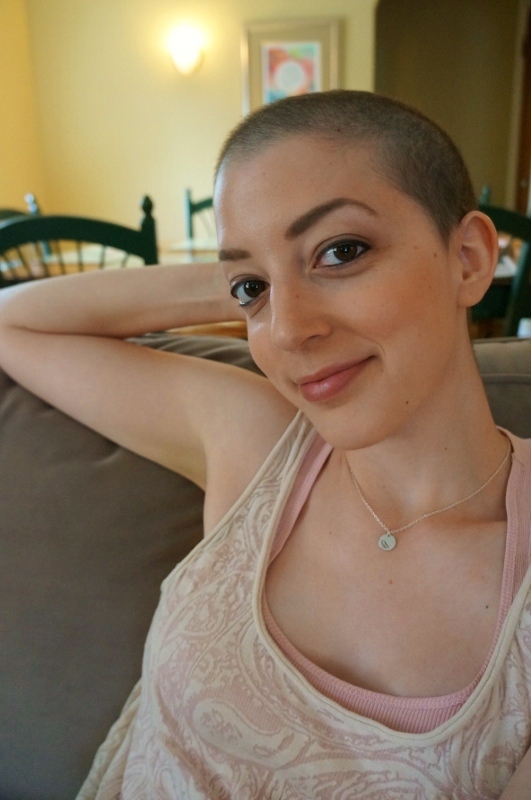 Maybe these photos will help someone going through chemo, because I can’t tell you how many times I tried to find images of people’s post-chemo hair growth. Front view. I’m not really sure what colour my hair is at this point. 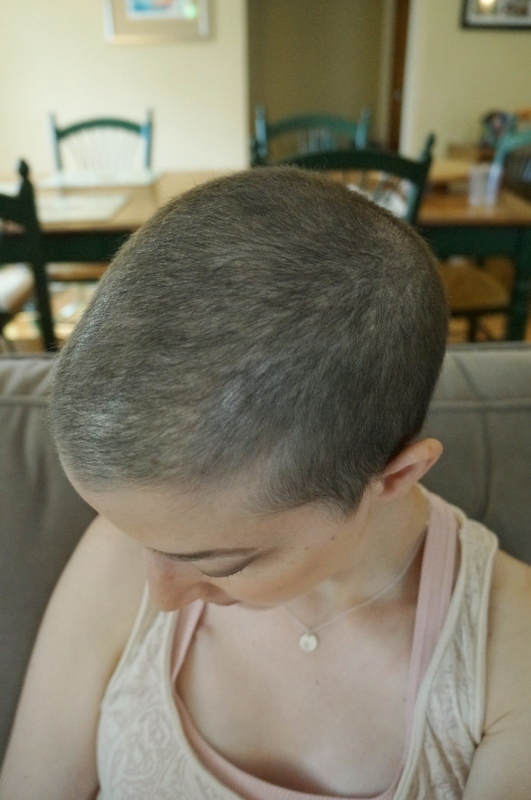 Many people have grey hair post-chemo. I wouldn’t say mine is grey, but it’s definitely not the deep brown it once was. Kind of a mouse-y brown. But I imagine it is temporary. You also might be interested to know that my body hair is returning in full-force. Just in time for summer, swimsuits, and short shorts. Yippee! Today I had radiation #4. Only 21 more to go! Oy. At this point, although it’s very early days, I still have no complaints besides some issues with mistakes in my schedule that hopefully will not keep happening, now that the staff know I am a force to be reckoned with. I’ve gotten pretty good at holding my breath with a tube in my mouth and a plug on my nose. Maybe after all of this, I can become a champion scuba diver. Does such a thing exist? I don’t know, but regardless, I don’t think that is my calling. Today I also decided to pop into the lab to get my routine blood work done. My last couple tests had one level increase that prompted a new wave of panic in me, even though my doctors told me not to worry about it. But once I learned what this increase could possibly signify, it was hard for me to ignore it. So I was a bit hesitant to check my results this afternoon, but as mentioned previously, I am extremely impatient. So I held my breath and checked, and what do you know. Everything is back to normal. 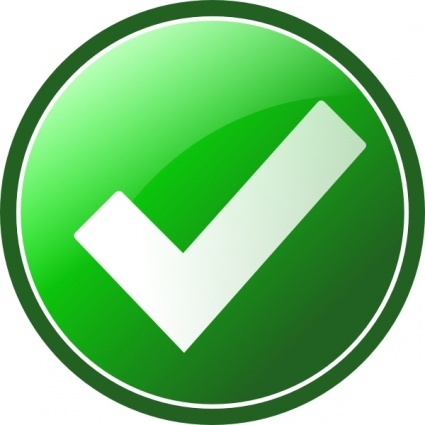 All green check marks. This is the first time I’ve seen everything be normal in awhile. And even though no one believed my previous results were anything to write home about, I still feel relieved. I like seeing those bright green check marks. Hello, I’m a straight A student. And patient. Anything less than a check mark is just insulting. So, there you have it. Some stuff. More to come soon. You can count on it. you are so beautiful, i never noticed you didn,t have hair. You beautiful smile and beautiful eyes make you outstanding.. Still one beautiful and spunky woman in my books! I would be staring because you really do look beautiful! Natalie Portman has some serious competition! You have a lovely shaped head and are beautiful even without your hair!!!! I am currently growing mine out so I can donate it…not sure if I told you that but you inspired me to do it. I’ve got it to grow so why not? Hair, no hair, who cares?? You are beautiful!